Anytime the market makes as big and consistent of a run as it did from March 2009 to the April peak, there’s a growing confidence that invites new money to the game. Those who were completely spooked in early 2009 saw an impressive rebound, not only in prices but in their willingness to participate. Of course, the longer in the tooth a rally becomes, the closer the end of it naturally gets. That’s unfortunate for some, but it’s simply the nature of risk in the market. After all, those who step out on a limb first will stand to make the most if they’re proven right, while others who wait for more of a sure thing may be among the last to the party right before it ends. It’s natural for someone who buys at or near the peak to quickly find themselves underwater, and at this point just a short time removed from the April highs, there are no doubt many folks who were late to the party now feeling serious pain. That feeling of panic has set in for them, and in most cases, there’s no exit plan. The failure to designate a safety net  prevents level-headed execution of a game plan, so now they’re forced to think fast in the heat of the moment, sparking a slew of potential mistakes. Making it back now becomes the primary goal, as if there’s something magical about getting out unscathed. Nevermind the fact that the entry was made in hopes of turning an actual profit. Traders face this dilemma on every timeframe when in a bad trade. With a negative P&L on the day, week, month, or year, the focus turns from sticking with a strategy to doing anything that might get them out of the hole – and fast. Along with this mindset comes an urgency factor which may not have been present before – uh oh! The sudden recognition that they might be perceived as having been wrong strikes fear in their hearts and now the race is on to erase the losses. Slow down. Often times the desire to just get into anything that might be moving means it’s also easy to overtrade . Spinning my wheels won’t help my P&L, and it sure won’t help my objectivity. Get selective. Rather than jumping quickly on anything that comes along, I’m going to be much more effective if I wait for the cream of the crop to surface. Waiting for the best risk/reward opportunities to arrive means passing up many other plays along the way, and returning to holding a high standard  for where my capital is allocated. On a day trading timeframe, it can be tough to take a few hits early in the session. Your confidence gets quickly shaken, and you wonder whether it’s just a tough start from which you can recover, or if instead it just isn’t your day. The key is to avoid emotion-based decisions, which will lower your standard for trades and shift your attention to the money rather than the price action. Never do you want your losses to cause you to force trades, so if that’s your primary motivator, get away and return another day. If instead there are still ample opportunities for good trades, patiently wait for the best risk/reward setups and then make the most of them. For a swing trading timeframe, streaks will happen where at times it seems you’re on the wrong side in every trade you place. Making it back will take a little longer, but it can be done if you’re methodical about it. Cut down your size immediately while you wait to find your groove, as that will slow the pace of your losses if you continue to time trades poorly. Become selective, because confusion can set in quickly if you aren’t following a clear strategy with a known objective. Patience will be crucial, but it can pay quite well , too. 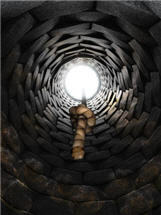 Finding yourself down in a hole is no fun, but it’s a reality of trading that each of us will face from time to time. So take a long-term view with your trading career, even if your timeframe for each trade is quite short-term. Doing so will keep you level-headed when it’s the hardest, and it’ll make you tougher and better as you find your way back on the right side – and you will!